In the June Budget, the coalition government announced a package of tax credit changes. The effect of the changes on different households will depend not only on levels of income, but also personal circumstances. There are three strands to the changes. The first is that once claimants' income reaches a certain threshold, their tax credits are withdrawn by 39p for every pound that their income exceeds that threshold. and £16,190 for those receiving only CTC. From April 2011, this "taper" will increase to 41p in the pound, so tax credits will disappear more quickly for people on modest and higher incomes. The second strand affects the so-called "family element" which, at present, every claimant with children receives. This is £545 a year for everyone with annual income of £50,000 or less. Above that, for most people - unless they have large families or substantial childcare costs - the £545 starts to be tapered at a rate of £1 in every £15. This means that you are entitled to some family element until your household income is about £58,000. From April 2011, the £50,000 threshold will be reduced to £40,000, and the taper increased to 41p in the pound. Finally, from April 2012, the £40,000 cut-off point will be removed, and the family element will be tapered at 41p in the pound as soon as the other elements of child and working tax credits have been reduced to nil. So far, the changes apply downward pressure on awards. However, the Budget announced an important extra benefit for families with children. The amount given in respect of each child - the "child element" of CTC - will increase by £150 above consumer price indexation in 2011-12 and again by £60 in 2012-13. This will help maintain existing award levels for people on below average incomes, although as income rises, the 41% withdrawal rate will erode their value. For those on very low incomes, the rise in the child element will provide some protection against the freezing of child benefit, which was also announced in the recent Budget. The following examples assume the same rates and thresholds in 2011-12 and 2012-13 as this year. £2,547.20 in 2012-13, taking account of the extra rise in each child element by £60. £37.01 in 2012-13, because the family element is tapered away immediately after the child element. Not all claimants have their awards curtailed at £50,000 or £40,000 income. Large families, particularly if they have substantial childcare costs, may still receive tax credits at much higher income levels. For example, for a family with three children, and claiming maximum possible childcare support, the cut-off point can be well over £65,000, using this year's rates and thresholds but a 41% taper. Tax credits awards are based initially on the income of the previous tax year. If current year income then rises, that does not affect the amount of the award, unless it exceeds the previous year's income by more than £25,000. If it does, the excess might give rise to an overpayment of tax credits at the end of the year, if the award is not adjusted in the meantime. If income falls below previous year's income, by however little, the claimant can immediately apply for a higher award. From April 2011, that will change. 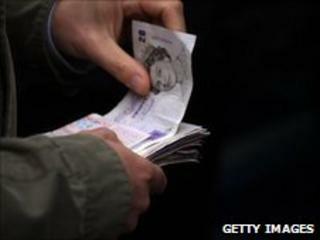 The £25,000 amount - known as the "disregard" - will come down to £10,000, then £5,000 from April 2013. These changes will increase the likelihood of overpayments due to income increases. Also, from April 2012, a disregard will be introduced when income falls. Instead of getting extra credit immediately, claimants will have to wait until their income has fallen by more than £2,500 below previous year's income. They can then claim extra credit based on their revised estimate of their income, disregarding £2,500 of the decrease. Take the example of Annie, a lone parent, who is paid £12,000 a year, but loses her job in July 2012. She applies for extra tax credits, and re-estimates her 2012-13 income at £3,000. Her revised award will be calculated as though her revised income were £5,500, because the first £2,500 of the fall in her income will be disregarded. The previous government announced that from April 2012, an additional amount of CTC would be introduced for those with children under three. This will no longer happen. However, the previous announcement - that those aged 60 and over would be able to qualify for WTC by working at least 16 hours, rather than 30 as currently required - will still go ahead from April 2011. Finally, where it is now possible to backdate claims and certain changes of circumstances by three months, from April 2012 the backdating period will be one month only. This will make it even more crucial that people do not delay claiming or reporting changes that increase their awards.